I have a lot of kid’s books. This one is my favorite of all time. It’s silly (as the title so helpfully suggests) but not in that annoying way, maybe like, say, Mr. Brown Can Moo, Can You? read 100 times at breakneck speed. 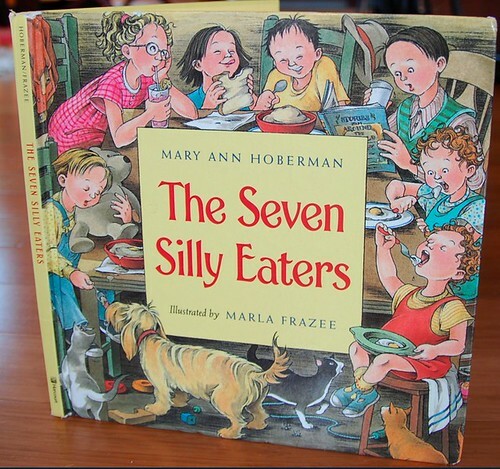 I could read The Seven Silly Eaters again and again and not want to claw my brain out. I just wish I knew why the Peters eaters were so hungry. A communal tapeworm? They do seem slim. Also, Mrs. Peters is pregnant all the time and they don’t show her eating so much. I love it when a book makes me think. This is the magic box. And I’m not talking about the TV. 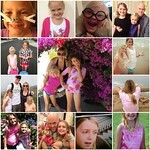 This has provided hours of entertainment (and in the interest of full disclosure, clean-up) for my two daughters. 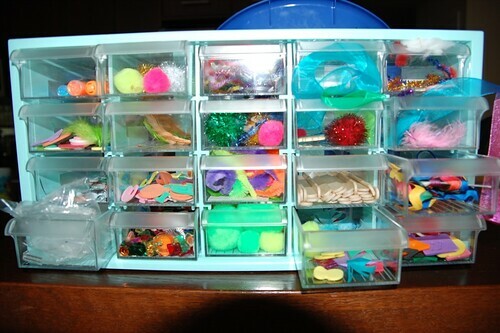 Chock full of twisty, bendy and messy things to create, glue, assemble and collage, this arts and crafts case contains everything you need to make book marks, puppets, handmade picture frames, and more. There’s buttons, sequins, feathers, pom poms, googly eyes, craft sticks, ribbons, paints, pipe cleaners, and more, including these curious plastic lid-like things that defy my imagination. Then again, I’m not crafty and never have been. Maybe those plastic things are well-known and respected among arts and crafters? Either way, I’m telling you: this is the holy grail of imaginative play.